RMF remains atop the leaderboard after the first six months of 2018, issuing $2.26 billion of HMBS securities for a 39.6% market share, more than double #2 AAG’s $1.05 billion and 18.5% market share. RMF’s totals include highly seasoned pools, issued throughout the half. FAR stays in third with $767 million issued and 13.4% market share. Ocwen Loan Servicing and Live Well Financial again round out the top five issuers. Ocwen issued $500 million for an 8.7% market share, and Live Well was fifth with $357 million issued for a 6.3% market share. The top five issuers accounted for 86% of all issuance, the same as last quarter. 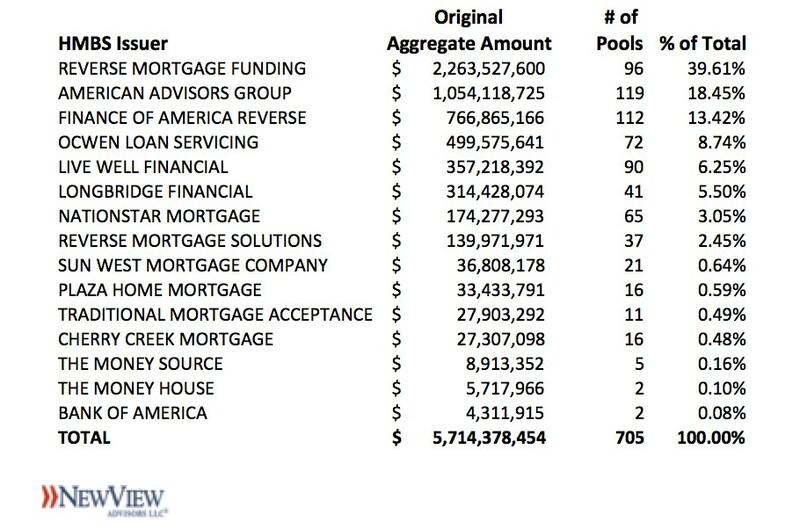 There were 15 active HMBS issuers in the half.